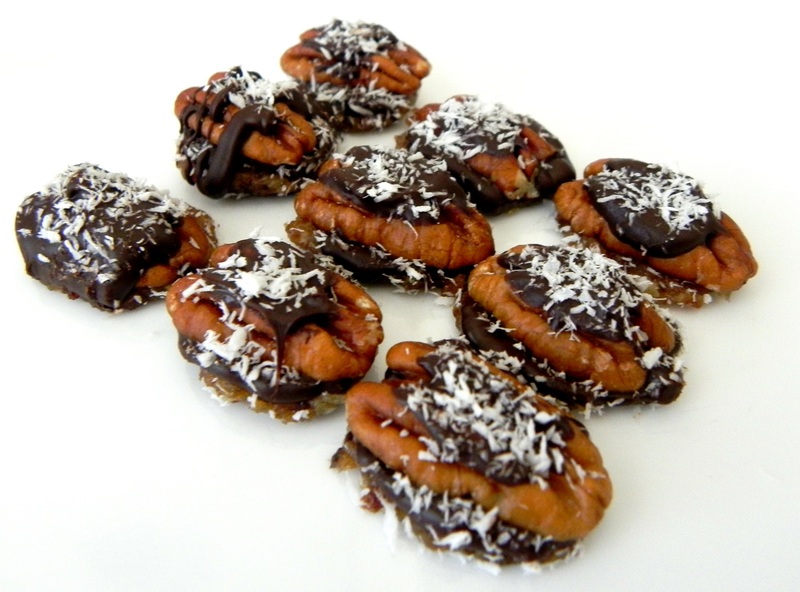 Trust me when I say these taste exactly like the famous Girl Scout Samoa cookies we all love. The best part is you can enjoy four or five of them without the guilt. And I know you know the guilt I’m taking about……it usually occurs after you polish off four (or ten) of those gooey caramel delights the second they arrive on your desk from your co-workers daughter (I won’t judge you if you don’t judge me). Place dates in food processor and process until they form a paste. Roll dates into 26 balls and flatten into small discs. Place each disc on a cookie sheet lined with wax paper. Melt the chocolate in a double boiler over the stove or in the microwave. Top each date disc with a small amount of chocolate followed by 1 pecan half. Drizzle extra chocolate over pecan half and top with coconut flakes. Place turtle bites in freezer until chocolate hardens.